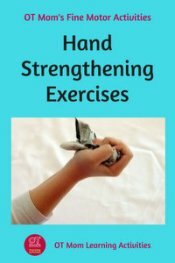 These finger exercises for kids are designed to increase the dexterity and skill of the tripod fingers, with the hope of ultimately improving your child's pencil control and handwriting. As you can see from the picture alongside, three fingers: the thumb, index and middle fingers work together to control the pencil in what is called a dynamic tripod pencil grasp. Some children have a pencil grip that looks a little different from this - you can take a look at some different functional pencil grasps on this page. 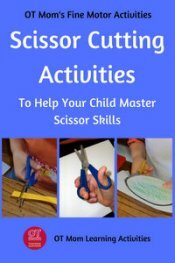 But with all of these grasps, the fingers need to work together well in order to control the pencil properly, and these finger exercises are designed to help your child improve these skills. 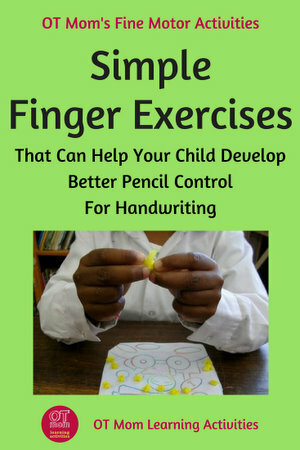 They can also be used as exercises to improve pencil control and handwriting. I need to use some jargon here! Keeping the ring and little fingers tucked away develops what is called the Distal Transverse Metacarpal Arch (DTM Arch).This is basically the arch formed across the hand by the knuckles - you can see it when you make a fist. 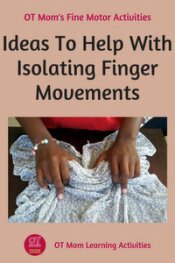 If your child struggles to keep the ring and little fingers down on a piece of paper, have your child hold down the fingers as shown alongside. Ok, now onto the fun finger exercises! Once they have got the hang of walking their fingers, then isolate the tripod fingers as explained above and try again. If your child has a "lazy thumb", try using just the thumb and index fingers to walk the ball! I have also used Modarri cars to get the tripod fingers moving on a screwdriver - check out my description of how to use Modarri cars for finger movements. 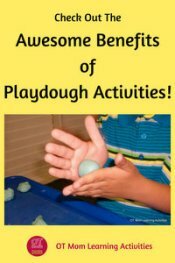 These can be used in many different ways in playdough creations- see my Playdough Activities page for ideas! Cut small squares of crepe or tissue paper ahead of time (crepe paper holds its shape better) . Give your child one piece of paper at a time to squish a bit as shown, using the tripod fingers of both hands. 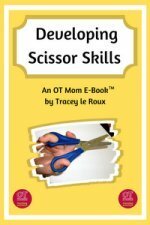 Then ask your child to use just the tripod fingers of the dominant hand to one-handedly ROLL the crumpled paper into a smaller, tighter ball. You can use the balls of crumpled paper to decorate a picture - they make great stars, leaves, or just interesting detail on a regular coloring picture! 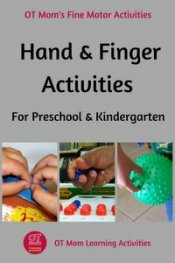 If your child is struggling to do these exercises for fingers, then these pages contain further activities that may help strengthen the hand muscles and work on hand dexterity. Please do seek a professional opinion if your child is struggling more than his/her peers. 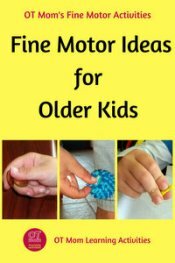 If you found these fine motor exercises helpful, here are some other pages on my site that may interest you! 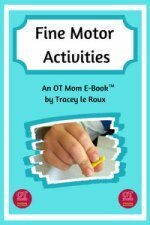 My OT Mom Fine Motor E-Books are packed full of easy activities like these finger exercises, as well as helpful information to help develop your child's fine motor skills. You can read an indepth description of each e-book by clicking on the images below. 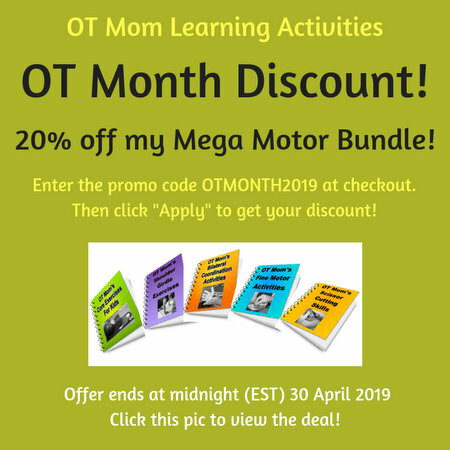 Don't forget to check out the discounted bundle deals! 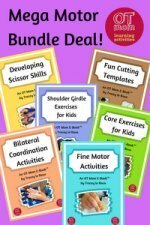 Pocket Full of Therapy have a great range of resources that you can use to work on fine motor skills. They kindly let me compile my favourites on a couple pages of their site - so pop on over and check them out - great for home or classroom use! Thank you for visiting my site! I trust you were helped and inspired! Why not sign up for my free occasional newsletter to stay in touch with updates to my site?